CANADA: Members of Canadian aboriginal communities and human rights activists have rallied in several cities in Canada and around the world against Ottawa’s policies violating the rights of the aboriginals. Supporters of “Idle No More,” a protest movement campaigning for the rights of the aboriginals in Canada, demonstrated Monday in 30 Canadian cities, including Montreal, Halifax, Ottawa, Vancouver, and Calgary, despite the country’s freezing winter weather. Some 300 protesters marched on Parliament Hill in Ottawa as MPs returned to the House of Commons after the six-week-long winter break, urging the MPs to take action on the rights of the indigenous people. Similar demonstrations were held in several states across the United States, including Florida, Massachusetts, New York, Texas, Washington State, and North Carolina. The movement began last November after Attawapiskat First Nations Chief Theresa Spence began a hunger strike over the violation of aboriginals’ rights. Spence ended her strike on Thursday after indigenous groups and opposition parties signed a deal spelling out a list of demands they would present to the government. The declaration calls for the government to improve housing and schools as well as to acknowledge treaty rights for Canada’s 600 native tribes. The protests over the past two months had prompted the United Nations to urge Canadian Prime Minister Stephen Harper’s government to set up talks in accordance with the standards expressed in the organization’s Declaration on the Rights of Indigenous Peoples. 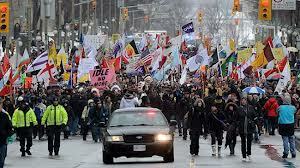 Since December 14, 2012, indigenous peoples in Canada have held demonstrations against the government which, on that day, approved Bill C-45 through parliament to change the rules about aboriginal lands.